Distribution and habitat: Leymus arenarius is native to Europe and was naturalised in Asia, Australia, New Zealand and North America. Leymus arenarius is an invasive grass of coastal beaches and dunes where it appears to be spreading quickly and outcompeting the native flora in regions were the plant was naturalised. Often it appear in association with Ammophila arenaria. It is well known as an important species in the stabilisation of mobile dunes and widely planted as a sand binder. Leymus arenarius is a perennial growing to 1.2m (4feet) by 2m (6feet) spreading at a fast rate. It is not frost tender. It is in flower in early summer and the seeds ripen in autumn. The flowers are hermaphrodite (have both male and female organs) and are pollinated by wind. Description: Leymus arenarius is a vigorous deciduous to semi-deciduous stoloniferous grass with 60-90 cm (23-35 inch) tall in culture with upright blue-gray blades and spreads wide by rhizomes. 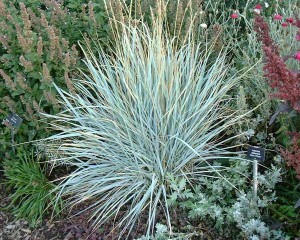 His blue-gray wide, ribbon-like foliage often turns tan in fall. 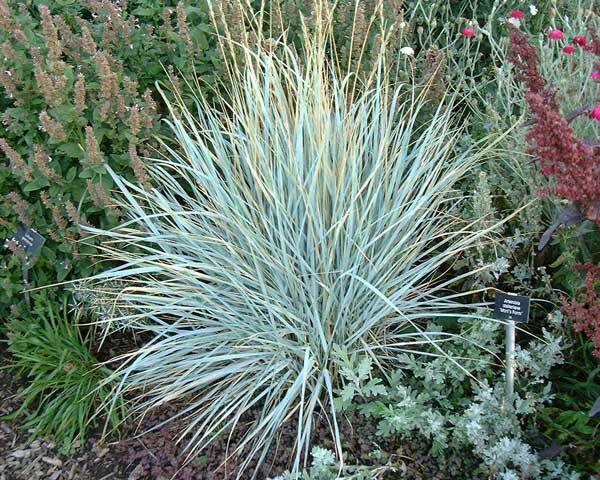 Grown for its display of exceptionally beautiful steel-blue foliage, this is a spreading grass that needs to be used carefully. Arching spikes appear in summer, blueish at fist, that fade to cream. The flowers are not ornamentally significant and sometimes are removed in summer. Leymus arenarius can spread too quickly in a sunny garden bed. Planted in a container the plant still gets the imposing sword shaped leaves that bend as they grow tall and develop the spiky flower heads. It is a cool season grass but tolerant of hot weather. It can become invasive. Leymus arenarius reaches the maturity in 2-5 years and under ideal conditions can be expected to live for approximately 10 years. Gardening: Leymus arenarius can tolerate maritime exposure and it is highly tolerant of urban pollution. It will even thrive in inner city environments. It has a fast growth rate. Cut back the old foliage to the ground in late fall or early spring to encourage new foliage and keep plants fresh looking with good blue colour. Position: Leymus arenarius can be placed in full sun or light shade. It will cannot grow in the shade. Plant it in full sun and give average to little water . Soil: Leymus arenarius is suitable for light (sandy), medium (loamy) and heavy (clay) soils, prefers well-drained soil and can grow in nutritionally poor soil. It is suitable for either acid, neutral and basic (alkaline) soils. It is able to handle environmental salt. Water: Leymus arenarius is very adaptable to both dry and moist locations and should do just fine under typical garden conditions. Established plants are very drought tolerant. Fertilising: Fertilising is generally not needed. Fertilizer causes lush growth that requires more water. If fertilization is needed, a slow release fertilizer can be applied in the spring. Propagation: Clumps are easily divided in spring or summer. Even small root pieces will grow. Larger clumps can be replanted direct into their permanent positions, though it is best to pot up smaller clumps and grow them on in a cold frame until they are rooting well. Plant them out in the spring. Leymus arenarius can be propagated as well by seed. Sow them in mid spring in site. Just cover the seed with a thin layer of sand. Germination should take place within 2 weeks. If the supply of seed is limited, it can also be sown in mid spring in a cold frame. When large enough to handle, prick the seedlings out into individual pots and plant them out in summer. Note: Leymus arenarius is a very invasive plant, spreading by means of its wide-ranging roots. Uses: Leymus arenarius is used as an accent plant or a ground cover. It is good for erosion control and sometimes is used to stabilize sand dunes. Will tolerate beachside conditions. Best to contain this in a planter, or use as a groundcover in a large sunny area. It looks its best when allowed to ramble among other perennial plants in a natural style border where its foliage is combined with flowering plants and is particularly successful in a modern prairie-style planting scheme where a mixture of fairly vigorous perennials are planted as a tall carpet punctuated by paths. It is considered to be drought-tolerant and thus makes an ideal choice for a low-water garden or xeriscape. Looks stunning in borders and makes a spectacular container plant for a sunny patio. Foliage of Leymus arenarius is terrific for flower arranging.